It poured the rain all afternoon and now it’s snowing and blowing like crazy. I have to admit it seemed to draw everyone a little closer at the conference – there was nothing else to do but hang around the exhibit hall. That was OK until 6:00 when the hall closed, triggering a mass exodus to the opening reception. Inga and I took one look at the mass of humanity and left since it would have taken forever to get food or drinks. The band was probably good, but you couldn’t tell because the "room" was like a 747 hangar with a cement floor and high ceilings. The heavy rain or snow or sleet or whatever it was sent everyone to the coat check stations, the taxi stand, and the shuttle buses, so there were long lines at all of those, putting a not-so-great end to the day. I started this morning by tripping over the giant bag of ads piled at my hotel room’s front door. There was a fake TV show on the shuttle’s TVs, complete with HIT commercials, of course. At the convention center, I thought the girls from Healthcare IT News were going to put someone’s eye out the way they were thrusting issues in everyone’s faces at every escalator and hall intersection (with most of the intended recipients using violent body English to avoid having to take one). Since the "opening" keynote wasn’t until 12:30, I went to three morning educational sessions. Two were OK and one was horrible. Since I was bored, I noticed how many times in the conference guides that EHR came out HER. Someone needs to help those HIMSS folks customize their Word dictionary. Lots of people showed up for the 12:30 session. HIMSS had a really good jazz band playing live (Skinny Williams Group). Last year’s official theme, "Now Is Our Time," was apparently taken off life support. Good idea. It was the usual multimedia extravaganza, with some violinists in there. They sounded good, but didn’t get to play much. The most ironic moment of the self-congratulatory HIMSS video was a shot of a wall breaking down with the label "Break down proprietary walls," with the irony being that the names of big companies were plastered everywhere and the repeated reference to the exhibit hall made it clear that proprietary has been berry, berry good to HIMSS (perhaps they meant that even more proprietary vendors should be congratulated for working on interoperability of proprietary systems). HIMSS board chair Chuck Christian had shaved off his beard, so nobody recognized him. He read of a long list of HIMSS accomplishments, pretty much every one of them related to lobbying the government for taxpayer dollars so that organizations who didn’t want software bad enough to pay for it with their own money could buy it with someone else’s. And if you were there for management systems, forget it — there was no effort at all to even mention the MS part of HIMSS (maybe they should just call themselves HIS). They did mention something called HIMSS Plug In that was said to be a consumer technology social network or something, but I wasn’t clear on what it was or how it’s accessed. No figures were given for conference attendance, but someone said they heard 27,000 which would beat last year (if you believe the number). Since HIMSS wants to break down proprietary walls, who better than to introduce the keynote than an executive from Siemens, the company paying for that session (and whose executives pleaded guilty of fraud for bid-rigging a PACS deal at Stroger Hospital right here in this very same Chicago not long ago). After a longish video with a deep-throat announcer proudly reading some classic Dennis Quaid cinema titles such as The Parent Trap and Innerspace, out came our keynoter. I’m going to try to be nice here. Dennis seemed likable, happy to be at the conference, and genuinely complimentary of the HIT work done by people in the audience. He was considerably more wrinkled and hoarse than you see on the movies, but that ear-to-ear grin still lights up even a big room. Applause was polite. I didn’t find him all that charismatic like I expected. He read most of his talk from the TelePrompter (stumbling a surprising number of times – I guess he’s used to getting multiple takes). He flashed pictures of his twins and of the heparin vials he said were "deadly similar" (maybe to a layperson, but they were about as clearly labeled as they could be even in the picture, with one saying Hep-Lock and the other labeled Heparin 10,000 units/ml with slightly different colored labels and completely different colored pop tops – the only similarity was that they were both in the standard 1 ml vial). He proudly announced that his family’s incident had motivated Cedars to spend $100 million on HIT, although you’d have to wonder what other pressing projects got shelved to free up the capital. One thing I agreed with: bar codes need to be universal and interoperable (thank a weak FDA for why that’s not the case today). He said bar code technology needs to be affordable for small hospitals, but didn’t elaborate how that’s going to happen. He pitched smart card medical records and inpatient access to charts by TV or cell phone. He barely mentioned his foundation, to which HIMSS gave him a check for $10,000 at the end. I can’t imagine that anyone in the room wasn’t aware of medical errors beforehand, so I have to question why HIMSS thought this would be a compelling opening keynote (a great number of people rushed for the doors when he started taking the couple of scripted questions HIMSS had put together). But, I saw him in my hotel lobby afterward and he was just hanging out, looking good, and being a regular guy. So, I would say Dennis was just fine, but he probably shouldn’t have been put up there. Booths seemed generally smaller and less elaborate. You could count the booth babes on one hand. There were a couple of magicians, a trick pool shot guy, and some mimes (seriously), but otherwise the in-booth entertainment was dialed back. McKesson still had some of that wildly electric blue, but it was toned down a lot. I still think Medicity’s spaceship-like booth is the coolest, but that’s just me. The HMS waitresses are as sassy as ever, at least when you get the ones who are paid actors and not the HMS employees rounding out their number. Kudos to OnBase with their usual sports bar theme, who served up soft drinks until 5:00, then rolled out the hard stuff. I was prowling for beer and was told EMC had some, but they had run out. Sentillion filled the bill admirably even though I clearly wasn’t a prospect. If I could pick one company and booth to see that’s clearly got new ideas and strong prospects, I would choose Voalte. They were wearing Pepto-Bismol colored bell bottoms, but demoing a very cool iPhone-based communication and alerting application. CEO Rob Campbell, with a long history of developing technology (PowerPoint and Filemaker) is fun. Booth 1481 is worth a visit. The busiest booth was Allscripts, which was mobbed from the time the doors opened until after the lights were dimmed. I don’t know what kind of audience they were getting or what products interested them, but it was packed. Second busiest (but in a relatively small booth) was dbMotion, whose people seemed pretty cool. Epic’s booth hasn’t changed and neither has Judy. She never left the time we were there, talked to pretty much anyone who wanted to chat, and displayed nothing to indicate her net worth or place in the HIT universe. The aforementioned Siemens had a nice, airy booth that I Iiked probably best of those from the big boys. Inga and I liked the Risarc people in 7215, who were manning their tiki hut, wearing Hawaiian shirts and sultry tropical dresses, and pouring rum punch. They did a nice job making it fun. I liked Sunquest’s booth a lot, very open and attractive in the green color (although the top looked like a big round trampoline to me). Their "Sunquest – we deliver" totes were the best ones I saw, well made in that bright green with black trim, so I’m taking one of those home. Most of our sponsors displayed the "We Power HIStalk" sign we made for them prominently, but Virtelligence gets the nod for putting it front and center. Somebody gave Inga and me those little chocolate bottles containing rum. Those were just about the best thing I’ve eaten lately. I wish I remember who had them since they deserve kudos – they can’t be cheap. I would like to have had about five of them since I would have simultaneously gotten both a sugar and and alcohol buzz on. After all that, I rode the shuttle home in the snow, ate a $15 hotel hamburger alone (funny how Inga reports the same thing below), and hit the laptop for what you’re reading now. We decided we should feature a smaller, lower key booth with people we liked. Introducing Chipsoft (that’s Paulette above, looking like an unseen giant is about to scoop her up), an HIS vendor from the Netherlands in Booth 6560 (not selling to the US, but interested in European attendees). Those yellow things on the floor are the coolest slippers, shaped like wooden shoes. People everywhere were descending on those people carrying them (like Inga), demanding to know where they got them. Chipsoft will put more of them out Monday, they said. A reader sent this: "One of the pre-Quaid speakers referred to the American Recovery and Disability Act. Does that make it the AR-DUH?" I don’t know if the TelePrompter was acting up or what, but everybody on the stage muffed their speeches several times. RSM McGladrey has "Official HISTALK Cynic" and "INGA FAN CLUB" badge ribbons at Booth 8039. As far as I know, that’s the only giveaway or goodie (unlike last year’s Fake Ingas, shoeshines, and other badge ribbons). We’re supposed to get 1-3" of snow tonight with winds tomorrow of 20-30 mph. Thanks, HIMSS. My hotel TV ran an ad for conventions in sunny San Diego, apparently rubbing it in. The Sun-IBM deal is off, apparently. 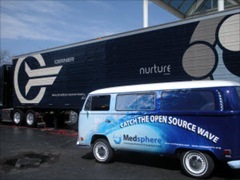 The Medsphere folks sent this picture over. "These photos about sum up the difference between Open Source and non interoperable, expensive proprietary models." That’s a cool PR move that must have required a lot of planning to pull off. We already ran the rumor, but Allscripts announces its iPhone application. Allscripts also announces a joint solutions deal with dbMotion (maybe that explains the booth crowds), apparently replacing the products that both Allscripts and Misys offered previously. iMedica announces a new PM/EHR system called Transition. We may need to swing by for a look. That’s about all I have the energy to write today. There were some announcements today (Allscripts, for example), but I expect most of the big ones will be held for Monday when the news is full-on and the stock markets are open. Let me start out by saying: My. Feet. Are. Killing. Me. And I even wore the comfy shoes. Right now I am in my lobby bar drinking an adult beverage, having had a couple of Advils to try to make the feet throbbing stop. And, I probably look like a total nerd typing away on my laptop, but who cares. I’m sitting next to a window and watching some huge snowflakes come down and waiting for my $15 hamburger to be served. First thing this morning, I attended a CCHIT Town Hall meeting led by Mark Leavitt and Alisa Ray. I was struck by the fact that CCHIT clearly sees themselves as the entity that has established "the" standards, though they acknowledge that the standards committee will tweak the final standards required for ARRA funding. In any case, vendors are sending in their certification applications at an unprecedented rate – something like 45 new applications in the last month, with 39% being never-before-certified vendors. I also went to the opening session to see Dennis Quaid. Cool live music and video started things off, followed by a rather lengthy intro by Chuck Christian of HIMSS. Christian shared all the great things HIMSS has done over the last year – and one might think they were personally responsible for including HIT in the recent ARRA legislation. So, I think Mr. H was a bit cynical about having Dennis Quaid as the keynote, but I personally thought it was an effective reminder that ultimately this whole HIT stuff is about the patient. Quaid admitted he is not an expert on technology or healthcare. Instead, he is a father, husband, and now an advocate. As I was walking out I overheard this comment: "There’s nothing like a human story to motivate IT. Especially when it involves babies"
Allscripts was amazingly busy every time we walked by. Other booths that appeared to be getting good traffic included Google (why? ), dbMotion, athenahealth, and McKesson. Not so busy: most of the other vendors in the ambulatory EMR space and all those small vendors are the outermost aisles. Far and away the best giveaway were the slippers from a Dutch company that looked like wooden shoes (I’d be wearing them if I weren’t in the lobby.) Booth babes are for the most part either eliminated due to budget constraints or simply too 20th century (in either case, I am ok with the demise of booth babes). Mr. H and I were so happy every time we saw a sponsor prominently display one of our signs (anyone see them?) Mr. H and I personally autographed each display, so thanks to all who put them out. By the end of the afternoon, Mr. H and I were getting thirsty for cocktails, so thanks to the folks at Sentillion were able to provide both Mr. H and me our beverages of choice. I took a few photos and will get those posted soon.I have managed to snap a few nice-looking pairs of shoes and was able to educate Mr. H and what shoes were and were not practical for walking the exhibit hall. Also got caught in the Olympic committee 2016 presentation this a.m., so I took a few shots of wrestlers in their cute outfits. In the Ribbon Race, i.e., the contest to see who can attach the most ribbons to his badge, I have so far seen two individuals tied for first place. Each had five ribbons. One is the CIO for a large health system in Texas and the other is a consultant, also from Texas. (Everything is bigger in Texas, I guess?) Surely there are some New Yorkers or Californians who can come up with six ribbons to take the lead. Early night for me before some early morning sessions. Can’t wait for the big HIStalk/Ingenix party Monday night! The more I see of HIMSS the more I think that it would make a great case study of how a member run organization morphs into a self serving organization run by a few that also happens to have members. 4. Really only appeals to hippies who are kidding themselves. Booth 3212 for the brandy chocolate. Mention you heard about it from the HIStalk blog and marketing material is optional.